Conan is awesome | Be Nice. My husband and I couldn’t stay up late to watch the entire last episode of Conan on the Tonight Show Friday night. But luckily thanks to Hulu we watched it last night! 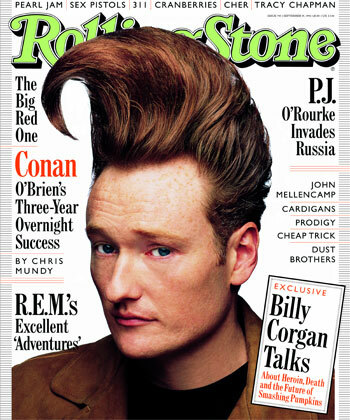 I have always loved Conan and his sense of humor–I loved his show more than any of the other late night hosts’ shows. But on that last show, I was more impressed with him than ever before. At the end of the segment, Conan explained that he did indeed have the right to say anything he wanted about NBC. And out of all the words he could have spoken, Conan spent those moments thanking NBC for being so good to him for twenty-plus years. Yes, he acknowledged their differences, but then focused on the much more substantial positive experiences he has had with NBC for the two decades earlier. We can all take this attitude to heart: how many marriages get caught up in petty arguments, ignorant of 20 years of good times? How many employees grow with resentment or indifference with a job that at one time gave them challenges, excitement, meaning, and fulfillment? Conan’s speech reminds us that people change, our desires change, and this is all very natural. But we cannot turn a blind eye in our frustration to the goodness and growth we gained from our experiences, no matter how they may end up. Absolutely beautiful words. Couldn’t agree more! This entry was posted in Amicable Allegories, At Work, How to Argue, To Be Nice is to be Compassionate and tagged Conan, Conan O'Brien, Conan's last Tonight Show speech, cynicism, NBC, The Late Show, The Tonight Show by Jen. Bookmark the permalink.